The St. Bernard or St Bernard (UK: /ˈbɜːrnərd/, US: /bərˈnɑːrd/) is a breed of very large working dog from the western Alps in Italy and Switzerland. They were originally bred for rescue by the hospice of the Great St Bernard Pass on the Italian-Swiss border. The hospice, built by and named after Italian monk Bernard of Menthon, acquired its first dogs between 1660 and 1670. The breed has become famous through tales of alpine rescues, as well as for its enormous size. The St. Bernard is a giant dog. The weight of the breed is between 65 and 120 kg (140 and 260 lb) or more, and the approximate height at the withers is 70 to 90 cm (28 to 35 in). The coat can be either smooth or rough; the smooth coat being close and flat while the rough is dense, flat, and more profuse around the neck and legs. The colour is typically a red shade with white, or a mahogany brindle with white. Black shading is usually found on the face and ears. St Bernard with the iconic barrel. The monks of the St Bernard Hospice attribute this legend to an 1820 painting by Edwin Landseer (see below). The ancestors of the St. Bernard share a history with the Sennenhunds. The St. Bernard, also called Alpine Mountain Dogs or Alpine Cattle Dogs, are the large farm dogs of the farmers and dairymen of most notably the French Alps, livestock guardians, herding dogs, and draft dogs as well as hunting dogs, search and rescue dogs, and watchdogs. These dogs are thought to be descendants of molosser type dogs brought into the Alps by the ancient Romans, and the St. Bernard is recognized internationally today as one of the Molossoid breeds. The earliest written records of the St. Bernard breed are from monks at the Great St Bernard Hospice at the Great St. Bernard Pass in 1707, with paintings and drawings of the dog dating even earlier. The first evidence that the dogs were in use at the monastery is in two paintings dating to 1690 by Italian artist Salvator Rosa. The most famous St. Bernard to save people at the pass was Barry (sometimes spelled Berry), who reportedly saved somewhere between 40 and 100 lives. There is a monument to Barry in the Cimetière des Chiens, and his body was preserved in the Natural History Museum in Berne. 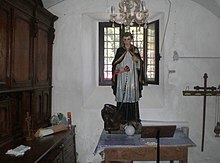 Another famous dog was Rutor, the faithful companion of the Italian priest Pierre Chanoux, who was named after the peak Tête du Rutor located above the Little St Bernard pass. The classic St. Bernard looked very different from the St. Bernard of today because of cross-breeding. Severe winters from 1816 to 1818 led to increased numbers of avalanches, killing many of the dogs used for breeding while they were performing rescues. In an attempt to preserve the breed, the remaining St. Bernards were crossed with Newfoundlands brought from the Colony of Newfoundland in the 1850s, and so lost much of their use as rescue dogs in the snowy climate of the alps because the long fur they inherited would freeze and weigh them down. The dogs never received any special training from the monks. Instead, younger dogs would learn how to perform search and rescue operations from older dogs. The Swiss St. Bernard Club was founded in Basel on 15 March 1884. The St. Bernard was the very first breed entered into the Swiss Stud Book in 1884, and the breed standard was finally approved in 1888. Since then, the breed has been a Swiss national dog. The dogs at the St Bernard hospice were working dogs that were smaller than today's show St Bernard's dogs. Originally about the size of a German Shepherd Dog, the St Bernard grew to the size of today's dog as kennel clubs and dog shows emphasized appearance over the dog's working ability, along with a closed stud book. An open stud book would have allowed breeders to correct such errors by breeding in working dogs of other dog breeds. 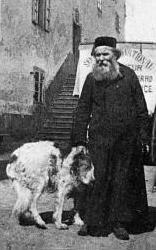 Italian priest Pierre Chanoux and his faithful St Bernard dog, Rutor. St. Bernard rescue dog in Valais. Painting by John Emms portraying St. Bernards as rescue dogs. Statue of Bernard of Menthon in Ascona (GE), Italy. The name "St. Bernard" originates from the Great St. Bernard Hospice, a traveler's hospice on the often treacherous Great St. Bernard Pass in the Western Alps, between Switzerland and Italy. The pass, the lodge, and the dogs are named for Bernard of Menthon, the 11th century Italian monk who established the station. "St. Bernard" was not in widespread use until the middle of the 19th century. The dogs were called "Saint Dogs", "Noble Steeds", "Alpenmastiff", or "Barry Dogs" before that time. The collective name for a large group of Saint Bernards is a "floof". The breed is strikingly similar to the English Mastiff, with which it shares a common ancestor known as the Alpine Mastiff. The modern St. Bernard breed is radically different than the original dogs kept at the St. Bernard hospice, most notably by being much larger in size and build. Since the late 1800s, the St. Bernard breed has been ever refined and improved using many different large Molosser breeds, including the Newfoundland, Great Pyrenees, Greater Swiss Mountain Dog, Bernese Mountain Dog, Great Dane, English Mastiff, and possibly the Tibetan Mastiff and Caucasian Ovcharka. Other breeds such as the Rottweiler, Boxer, and English Bulldog may have contributed to the St. Bernard's bloodline as well. It is suspected that many of these large breeds were used to redevelop each other to combat the threat of their extinction after World War II, which may explain why all of them played a part in the creation of the St. Bernard as seen today. The four Sennenhund breeds, the Grosser Schweizer Sennenhund (Greater Swiss Mountain Dog), the Berner Sennenhund, (Bernese Mountain Dog), the Appenzeller Sennenhund, (Appenzeller), and the Entlebucher Sennenhund (Entlebucher Mountain Dog) are similar in appearance and share the same location and history, but are tricolor rather than red and white. The Russian army kennels crossbreed St Bernards with Caucasian Ovcharka to produce the Moscow Watchdogs that are still used as military service dogs in Russia today. St Bernards have in common many characteristics of other mountain dog breeds. St. Bernard dogs are no longer used for Alpine rescues, the last recorded instance of which was in 1955. As late as 2004, the Great St Bernard Hospice still retained 18 of the dogs for reasons of tradition and sentiment. In that year the Barry Foundation created breeding kennels for the breed at the town of Martigny down the Great Saint Bernard Pass, and purchased the remaining dogs from the Hospice. During the summer months each year a number of the animals are temporarily relocated from Martigny to the Hospice for viewing by tourists. An annual celebration of the breed takes place on the Little Saint Bernard Pass and at the town of Rosières-Montvalzan on the French side. Saint Bernard dog enthusiasts and breeders gather for a dog show and parades. The animals bred by the Foundation are trained to participate in a variety of dog sports including carting and weight pulling. The dogs at the Barry Foundation are reportedly smaller than the average St Bernard. The very fast growth rate and the weight of a St. Bernard can lead to very serious deterioration of the bones if the dog does not get proper food and exercise. Many dogs are genetically affected by hip dysplasia or elbow dysplasia. Osteosarcoma (bone cancer) has been shown to be hereditary in the breed. They are susceptible to eye disorders called entropion and ectropion, in which the eyelid turns in or out. The breed standard indicates that this is a major fault. The breed is also susceptible to epilepsy and seizures, a heart disease called dilated cardiomyopathy, and eczema. US and UK breed clubs put the average lifespan for a St. Bernard at 8–10 years. A 2003 Danish breed survey (35 dogs) puts the median lifespan at 9.5 years while a UK breed survey in 2004 (53 dogs) puts the median lifespan at 7 years. In the UK survey about one in five lived to >10 years with the longest lived dog at 12 years and 9 months. A study of genetically related polyneuropathy in the breed was conducted. Known as a classic example of a gentle giant, the Saint Bernard is calm, patient and sweet with adults, and especially children. However St. Bernards, like all very large dogs, must be well socialized with people and other dogs in order to prevent fearfulness and any possible aggression or territoriality. The biggest threat to small children is being knocked over by this breed's larger size. Overall they are a gentle, loyal and affectionate breed, and if socialized are very friendly. Because of its large adult size, it is essential that proper training and socialization begin while the St. Bernard is still a puppy, so as to avoid the difficulties that normally accompany training large dogs. An unruly St. Bernard may present problems for even a strong adult, so control needs to be asserted from the beginning of the dog's training. While generally not instinctively protective, a St. Bernard may bark at strangers, and their size makes them good deterrents against possible intruders. The Saint Bernard was bred to be a working companion and to this day the St. Bernard lives to please its master and is an amiable yet hard worker. St. Bernards have retained their natural ability for scent work and depending on the skill of the trainer and the talents of the dog, St. Bernards can participate in tracking events or even become involved in search and rescue work. St. Bernards were exported to England in the mid-19th century, where they were bred with mastiffs to create an even larger dog. Plinlimmon, a famous St. Bernard of the time, was measured at 95 kg (210 lbs) and 87.5 cm (34​1⁄2ins), and was sold to an American for $7000. Commercial pressure encouraged breeding ever larger dogs until "the dogs became so gross that they had difficulties in getting from one end of a show ring to another". An 1895 New York Times report mentions a St. Bernard named Major F. measuring 8 feet 6 inches (2.59 m) in length, who, if the claims are true, would be the longest dog in history. Another St. Bernard named Benedictine V Schwarzwald Hof (Pierson, Michigan, USA) also reached 315 lb (143 kg), which earned a place in the 1981 edition of the Guinness Book of World Records. St. Bernards are often portrayed, especially in old live action comedies such as Swiss Miss, the TV series Topper, and classic cartoons, wearing small barrels of brandy around their necks. Avalanche victims supposedly drank the brandy to stay warm while awaiting rescue, although this is medically unsound. The monks of the St. Bernard Hospice deny that any St. Bernard has ever carried casks or small barrels around their necks; they attribute the image to an 1820 painting by Edwin Landseer, perhaps Alpine Mastiffs Reanimating a Distressed Traveler (which became a popular engraving in 1831 by Charles Landseer). The monks did keep casks around for photographs by tourists. The breed of dogs kept by the monks to assist them ... has been long celebrated for its sagacity and fidelity. All the oldest and most tried of them were lately buried, along with some unfortunate travellers, under a valanche [sic]; but three or four hopeful puppies were left at home in the convent, and still survive. The most celebrated of those who are no more, was a dog called Barry. This animal served the hospital for the space of twelve years, during which time he saved the lives of forty individuals. His zeal was indefatigable. Whenever the mountain was enveloped in fogs and snow, he set out in search of lost travellers. He was accustomed to run barking until he lost breath, and would frequently venture on the most perilous places. When he found his strength was insufficient to draw from the snow a traveller benumbed with cold, he would run back to the hospital in search of the monks…. When old age deprived him of strength, the Prior of the Convent pensioned him at Berney, by way of reward. After his death, his hide was stuffed and deposited in the museum of that town. The little phial, in which he carried a reviving liquor for the distressed travellers whom he found among the mountains, is still suspended from his neck. A Punch magazine cartoon from 1949 depicts a man with a St. Bernard and several puppies, all of which are wearing neck casks. The man explains, "Of course, I only breed them for the brandy." A frequent joke in old MGM and Warner Brothers shorts is to depict the dogs as compulsive alcoholics who engage in frequent nips from their own casks. Burtonswood (Bossy Boots). English and Irish Crufts Supreme Champion (1974), Breeder was the late Miss Marjorie Hinds. Beethoven (from the movie series of the same name) The 1992 comedy film Beethoven features a large, friendly but troublesome St. Bernard and, in later sequels, his mate and their brood of unruly pups. According to the producers of the sequel Beethoven's 2nd, the St. Bernards used in the film grew so fast during filming that over 100 St. Bernard puppies were cast to portray the sequel's four puppies (Tchaikovsky, Chubby, Dolly, and Mo) and a mother St. Bernard named Missy. Cujo, a dog who had his friendly demeanor ruthlessly taken from him by rabies and becomes crazed, terrorizing the residents of the fictional town of Castle Rock, Maine from the 1981 Stephen King novel Cujo and the 1983 film of the same name. George, eponymous dog in the movie "George!" (1971) and its 1972–73 spinoff television series. Josef, from the Japanese anime series Heidi, Girl of the Alps (Alps no Shoujo Heidi). Neil, the martini-slurping St. Bernard of George and Marion Kerby in the 1950s television series Topper. This was a follow up to Topper, Topper Takes a Trip, and Topper Returns. Sumo, a St. Bernard belonging to Lt. Hank Anderson in the video game Detroit: Become Human. 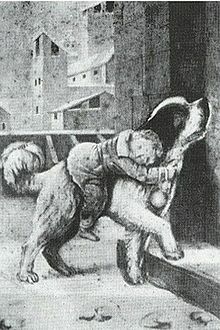 Unnamed "faithful hound" who discovers the frozen body of a traveller bearing "a banner with a strange device" attempting to cross the Saint Bernard Pass in Henry Wadsworth Longfellow's poem "Excelsior". The famous St. Bernard dog Barry found a small boy in the snow and persuaded the child to climb on his back. The dog then carried the boy to safety. ^ Buck in "Call of the Wild" is described thus: "His (Buck's) father, Elmo, a huge St Bernard, had been the Judge's inseparable companion, and Buck bid fair to follow in the J way of his father. He was not so large,—he weighed only one hundred and forty pounds,—for his mother, Shep, had been a Scotch shepherd dog. Nevertheless, one hundred and forty pounds, to which was added the dignity that comes of good living and universal respect, enabled him to carry himself in right royal fashion." Call of the Wild (novel). ^ The use of the term "Scotch shepherd dog" is an archaic Victorian phrase which probably refers to Scotch Collie, or Old Time Farm Shepherd, but might refer to English Shepherd. "Name That Breed – A Collie By Any Other Name…". Old-Time Farm Shepherd. Retrieved 9 October 2012. "Defining a Breed: An Apologia of the OTFS". Retrieved 9 October 2012. ^ A St. Bernard was used in the Clark Gable version, The Call of the Wild (1935 film). Three Leonberger 'actors' (one was a female, and two males) played the starring dog "Buck" in The Call of the Wild: Dog of the Yukon (1997), "Call of the Wild - Dog of the Yukon". Internet Movie Data Base. Retrieved 8 October 2012. a Canadian rendition of Jack London's Call of the Wild starring Rutger Hauer as John Thornton (narrated by Richard Dreyfuss). "Leonberger Facts". American Kennel Club. Retrieved 8 October 2012. Nevertheless, films and television renditions have varied the dog breed. The book was also adapted in The Call of the Wild by D. W. Griffith (1908); a second silent film (1923) by Hal Roach; The Call of the Wild (1972 film) and Call of the Wild 3D (2009). It has also been the subject of three television programs or films: The Call of the Wild, a 1976 American TV film starring John Beck, with a screenplay by James Dickey; The Call of the Wild, a 1993 American TV film starring Rick Schroder; and Call of the Wild (TV series), a 2000 adventure series on Animal Planet. ^ "A brief history of the St Bernard rescue dog". Smithsonian. Retrieved 5 August 2016. ^ a b c "Saintly Bernards Rescue - History". members.petfinder.com. ^ "The St Bernard: the making of an Alpine legend". House of Switzerland. 12 May 2017. ^ "Australian National Kennel Council". Ankc.org.au. 15 December 2011. Retrieved 25 July 2015. ^ "Breeds nomenclature" (PDF). Fédération Cynologique Internationale. Retrieved 15 January 2014. ^ "The Legendary Barry at the Natural History Museum". Natural History Museum of Bern. Naturhistorisches Museum der Burgermendiz Bern. Archived from the original on 7 September 2010. Retrieved 20 March 2011. ^ Blumberg, Jess (1 January 2008). "A Brief History of the St. Bernard Rescue Dog: The canine's evolution from hospice hound to household companion". Smithsonian magazine. Retrieved 12 June 2011. ^ "The Newfoundland". Dog Owners Guide. Retrieved 13 June 2011. ^ a b Clark, Anne Rogers; Andrew H. Brace (1995). The International Encyclopedia of Dogs. Howell Book House. pp. 381–383. ISBN 0-87605-624-9. ^ "Dogs Learn by Modeling the Behavior of Other Dogs". 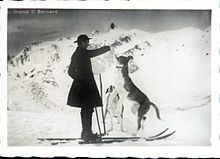 ^ "In 1962, an avalanche dog over to Great Dixence is organized at the initiative of Canine Club of Sion. A TSR camera is present on The working St Bernard dogs at the hospice was still smaller than the show St Bernard dogs during 1962 and premises". Retrieved 2 September 2015. ^ "St Bernard breeding: why Barry got a bigger head". Retrieved 2 September 2015. ^ a b c "Dog Owner's Guide Profile: The St. Bernard". Canismajor.com. Retrieved 19 December 2011. ^ Richard Beaver; Rachel Beaver (1988). All about the St. Bernard. Pelham. p. 28. ISBN 978-0-7207-1815-7. ^ "The History of the Mastiff — English Mastiff — dog of dogs". Webbusiness.no. Retrieved 19 December 2011. ^ "The Little Saint Bernard pass, dog parade". Le Dauphiné Libéré. Retrieved 5 August 2016. ^ Bech-Nielsen; S.; Haskins; M. E.; et al. (1978). "Frequency of osteosarcoma among first-degree relatives of St. Bernard dogs". J Natl Cancer Inst. 60 (2): 349–53. doi:10.1093/jnci/60.2.349. PMID 271748. ^ "Breed Information". The English Saint Bernard Club. Retrieved 28 March 2012. ^ "Breeder Advertisements". Saint Bernard Club of America. Retrieved 28 March 2012. ^ Cassidy, Kelly M. (1 February 2008). "Breed Longevity Data". Dog Longevity. Retrieved 18 September 2012. ^ Proschowsky, H. F.; Rugbjerg, H.; Ersbøll, A. K. R. (2003). "Mortality of purebred and mixed-breed dogs in Denmark". Preventive Veterinary Medicine. 58 (1–2): 63–74. doi:10.1016/S0167-5877(03)00010-2. PMID 12628771. ^ "Summary results of the Purebred Dog Health Survey for the St Bernard breed" (PDF). Kennel Club/British Small Animal Veterinary Association Scientific Committee. Retrieved 28 March 2012. ^ Ekenstedt, Kari J.; Becker, Doreen; Minor, Katie M.; Shelton, G. Diane; Patterson, Edward E.; Bley, Tim; Oevermann, Anna; Bilzer, Thomas; Leeb, Tosso; Drögemüller, Cord; Mickelson, James R. (2 October 2014). "An ARHGEF10 Deletion Is Highly Associated with a Juvenile-Onset Inherited Polyneuropathy in Leonberger and Saint Bernard Dogs". PLOS Genetics. PLOS. 10 (10): e1004635. doi:10.1371/journal.pgen.1004635. Retrieved 13 March 2015. ^ Stenmark, Betty-Anne. A New Owner's Guide to Saint Bernards. New Jersey, U.S.A.: T.F.H. pp. 23–25. ISBN 0-7938-2810-4. ^ Walker, Joan Hustace (1998). Saint Bernards A Complete Pet Owner's Manual. Hong Kong: Barrons. pp. 14–22. ISBN 0-7641-0288-5. ^ Hustace Walker, Joan (2000). Saint Bernards: Everything About Purchase, Care, Nutrition, Breeding, Behavior and Training (Barron's Complete Pet Owner's Manuals). p. 11. 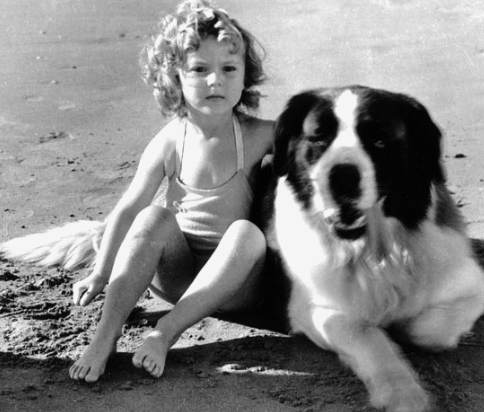 ^ "A Large St. Bernard Dog Killed" (PDF). The New York Times. 31 December 1895. ^ "Dogs from Our Past". Schwarzwald Hof Kennels. Retrieved 3 June 2011. ^ "Legend of the St. Bernard Barrel". It's the dogs' life. Archived from the original (http) on 18 February 2014. Retrieved 19 January 2016. ^ Pickow, George (1957). "The Great St. Bernard Hospice Today". National Geographic, January 1957. Archived from the original (http) on 15 December 2005. Retrieved 26 January 2006. ^ Byerley, Thomas (1823). The Percy Anecdotes (1826 ed.). London: T. Boys. pp. 25–26. Retrieved 15 April 2018. ^ McPherson, Stephanie Sammartino; Gardner, Joseph Sammartino (2003). Wilbur & Orville Wright: taking flight. Minneapolis, MN: Carolrhoda, Inc. p. 103. ISBN 1-57505-443-4. Retrieved 6 January 2012. Wikimedia Commons has media related to St. Bernard dog.